ROOF RIDE 2019 IS OPEN! Click Here to Register! Join The Foundation For Tomorrow for the inaugural 7-day ride around the Roof of Africa. ROOF RIDE is a 250 mile bike adventure encircling Mount Kilimanjaro. Views of Mount Meru and a magnificent crater lake on the border of Kenya, wildlife encounters, and interaction with local Tanzanians are all part of the journey. Join us to see the beauty of Tanzania firsthand and witness TFFT’s mission in action. Discover a new place, experience amazing transformation, and prove to yourself that you are capable of more than you can imagine. 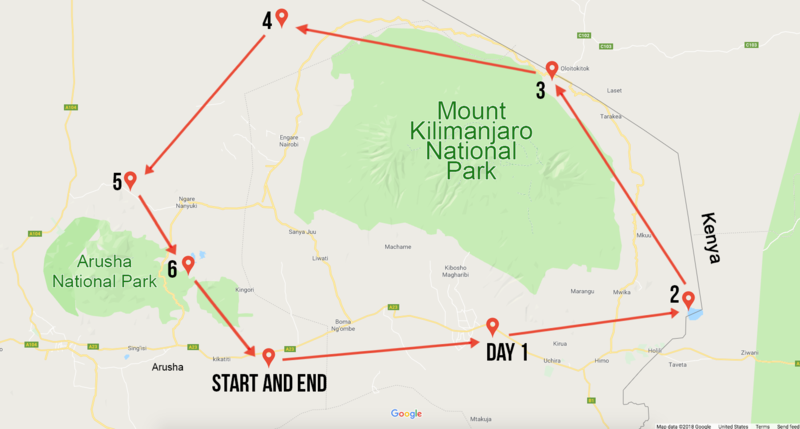 Due to the complexity and preparation required to bike across Tanzania, we need 12 riders committed by March 2019 to confirm this event for June 2019! The route is 260 miles in total - 64% gravel/loose dirt, 30% tarmac, and 6% sand. You do not need to be an athlete to participate in ROOF RIDE. This is a journey, not a competition. If you are active, goal-oriented, and looking for an adventure, you have what it takes to become a ROOF RIDER! The trip itself costs $2,700 paid directly to Adventure International, our safari partner for Team TFFT events. This covers your bike rental, food, lodging accommodations, and guide support for your stay in Tanzania (9 nights). Depending on when you book and your flight preferences, airfare will cost anywhere between $1,800 - $2,500. You should also allocate $250 for immunizations, malaria medicine, and your visa. Travel Insurance is also an important security measure that Adventure International strongly advises you purchase. For recommendations, you can review Adventure International's travel insurance page. Travel Insurance is there to cover things that Adventure International cannot - repatriation, costs of things like helicopters, trip cancellation, and so on. Please do not rely on automatic cover from credit cards, read the small print, and if you need any help, email the Adventure International team. Monday, July 1: 250 miles of biking! Book flights to Kilimanjaro International Airport (JRO). Traveling from the US will take approximately 24 hours (depending on layover times). The trip includes all accommodations from June 29 – July 7, including a hotel stays in Arusha and tented camp lodging throughout the ride. Some riders choose to extend their stay by lounging on a beach in Zanzibar for a couple extra days. If this is an option for you, we highly recommend it! Sunshine and relaxation will feel great! We can help you book a flight to your destination choice. From there, we are happy to put you in touch with a travel agent to explore your options. We would love to answer and share stories of the adventures that await. Call or email anytime.